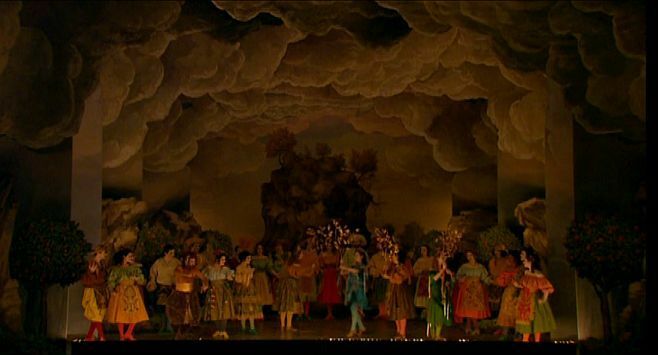 I just discovered a most amazing cultural artifact: Vincent Dumestre and Benjamin Lazar's 2008 resurrection of Jean-Baptiste Lully's Metamorphoses-inspired "Cadmus et Hermoine," the first French opera, which premiered on April 27, 1673 and has long since faded into obscurity. This 21st Century revival of a baroque original is like a magnificent, life-sized toy theatre come to glorious and uncanny life, and functions as more like time-travel than performance, with its lavishly reproduced stage machinery, sets, costumes, makeup, mannered performance style, dance sequences, and completely candle-lit stage all painstakingly based on baroque originals. The music, too, is unforgettable; hauntingly lovely and slightly alien, yet, somehow, utterly familiar at the same time. The event of the year! The team led by conductor Vincent Dumestre and Benjamin Lazar has produced the very first French opera, composed in 1673 by Lully with a libretto by Quinault. 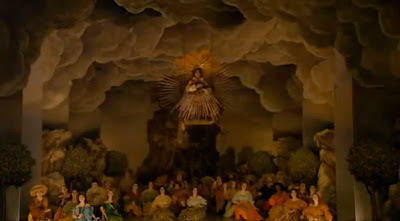 With reconstructed sets and costumes, this entirely candle-lit production is a landmark in the rediscovery of baroque opera, providing a unique opportunity to discover a musical masterpiece that has fallen into oblivion over the last 3 centuries. Performers include Andre Morsch, Claire Lefilliatre, Arnaud Marzonati, Jean-Francois Lombard, Isabelle Druet, Arnaud Richard, and Camille Poul with the Orchestra, Choir, & Dancers of Le Poeme Harmonique. Vincent Dumestre directs this performance of Jean-Baptiste Lully's CADMUS ET HERMOINE. Composed in the 17th century, this libretto is a classic example of a musical tragedy and is known as the first French opera. Click here to find out more, or purchase the DVD. Click here (highly recommended!) to view many more segments on the Oedipus at Versailles You Tube station. You can find out more about the history of the Cadmus et Hermoine opera here.